FROM Interstate 8 -- Take Mission Gorge Road to Friars Road and turn left. Continue on to Santo Road and turn right. Make an immediate right again onto Admiral Baker Road and follow it down the hill. At the bottom on the hill turn right into the parking lot. -- FROM Interstate 15 -- Exit Friars Road East. Follow Friars Road to Santo Road. At Santo Road turn left. Take an immediate right onto Admiral Baker Road and follow it down the hill. At the bottom on the hill turn right into the parking lot. Accepted. 1 year in advance for active duty, 66 months for Retired/DoD, and 1 month for public civilians. The public must call the office for reservations. Military can also use the online reservation system. Pets allowed with normal leash and clean-up rules. 2 dog limit. 1st dog is free, 2nd dog is $1 per night. Although operated by the Navy, this RV park is also open to the public. Maximum stay is 30 Days with 14 days out. A 15 day extension possible if space is available. Public civilians can only stay 14 days. Lower rates for military - higher rates for civilians. 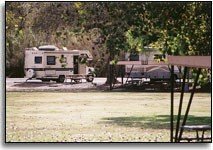 Nestled alongside the Admiral Baker Golf Course in Mission Gorge is the Admiral Baker RV Park campground. 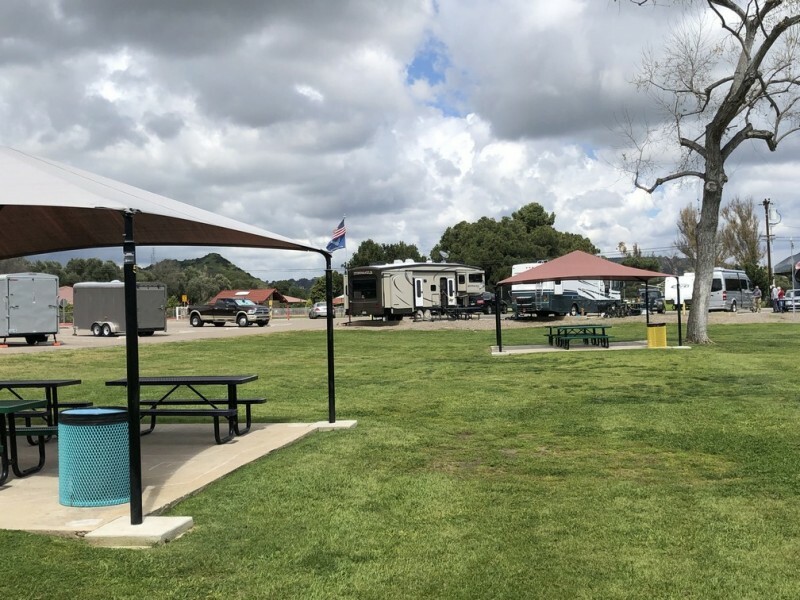 The campground is centrally located just a few miles away from Interstate 8 and Interstate 15 and only minutes away from SDCCU Stadium. The grounds, well-suited for all ages, include playground equipment, an outdoor swimming pool, picnic areas, two volleyball courts, three basketball courts, three ball fields, two tennis courts and two horseshoe pits. 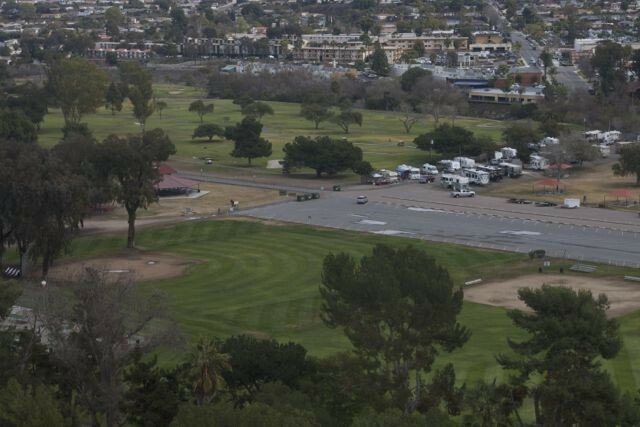 Nice RV Park located in San Diego. Easy, peasy access, much, much easier than Fiddlers Cove. No problem finding it but beware the hill arriving & departing is steep grade. Park in the huge parking lot and walk down the path to the office. In-checking was painless with very friendly staff. We were offered our choice of several different sites which was really nice because of the length of our rig. The RV park was moved and trimmed nicely. Pavilions throughout the grassy area for everyone to use. 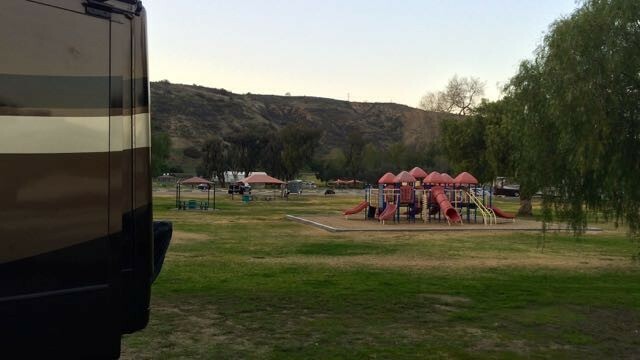 Very family friendly, but the down side was due to the park layout, the kids regularly cut through the RV sites to get to the playground area. We did not use the bathroom or shower facilities, nor did we use the WiFi. The laundry facilities included (?) six washers and six dryers $1 each. One of the greatest benefits from our standpoint is the proximity to the SDCCU Stadium which is the closest Metro Green Line station. We took the Green line downtown several times - much easier than trying to maneuver or park our one ton dually long bed truck down there. We toured Petco park (Padres MLB stadium), attended a baseball game there, visited Old Town area and toured around there and also the USS Midway ship (drove to it). If staying at Admiral Baker, highly suggest using the mass transit. Cheap and easy. We would definitely stay here again. Very nice, relaxed park. The grassy area in the middle is great for kids to play and very visible from ever camp spot. Hosts were amazingly nice and helpful, and everyone at the park seemed amenable. We came because of a soccer convention on Hotel Circle...couldn't see paying a ton of money for a questionable room when we have luxury accommodations right behind our truck! Sure beat the riff-raff at the hotel. Very nice stay! As with all Navy run RV Parks this one charges a higher nightly rate. To the comments made regarding pests, I was there for a month, (Oct), and had no problem with ants or mice. The squirrels however were quite prevelant. For those having problems, stringing lights that flash along the undercarriage of your rig is cheaper than calling out the pest control people. And for ants, I carry "Home Defense" in my trailer which has served me well when I set up and spray around the undercarriage. Had the chance to play both courses at the Golf Course and enjoy an inexpensive hamburger plate at the Clubhouse. The proximity to Mission Valley is very convenient to include a Lowes and Costco as well as the SDCC Stadium that will soon be going through some changes depending on which measure got the vote. Going east on Friars Road, there are numerous restaurant choices, a Vons market, Petco and if you go a little farther one of the largest recreational parks in the US, Mission Regional Park with it's 5 Peak Challenge, which you can easily complete in 3 hikes if you do a little research at the Visitors Center. All in all this is an excellent park to settle in for a couple weeks or a month and take in much of what the area has to offer. 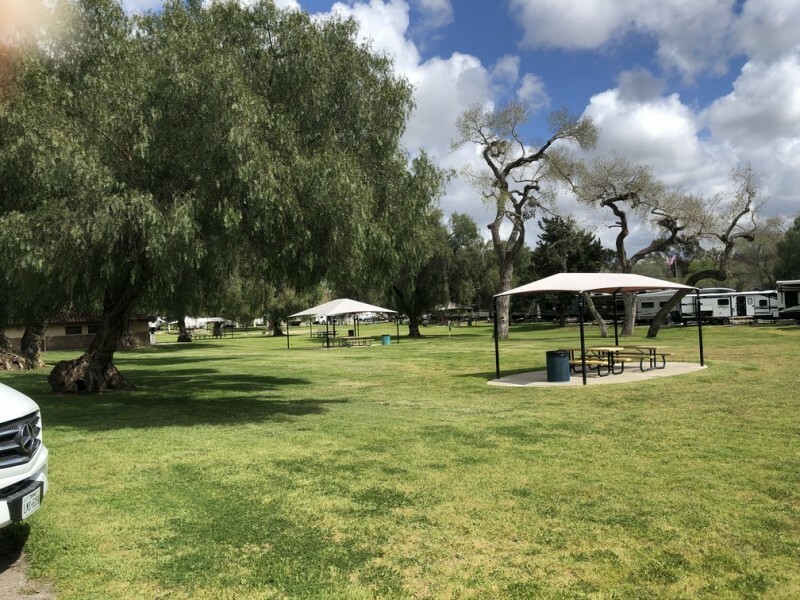 And if you want to stay in the area a little longer, and don't mind dry camping for awhile, check out the new Bay View RV Park in Point Loma as there is much to be enjoyed in that area as well. Hope this helps, safe travels. Only complaint I had was that the pool was closed to guests. They only open the pool with scheduled event. The pool was the main reason I chose this park. Very nice park! Good sized sites. Good base camp for SD attractions. While the sites here are very close together, and the pads kind of short, they make up for it with really great common picnic areas. Not a bargain compared to other military facilities, but compared to anything else in the area, it is great. You can't beat the location. It's close to the freeway, but in a little cul de sac so the traffic noise isn't bad at all. The office staff was very friendly and helpful. One odd thing - there is a golf course and driving range right next to the RV park, but you cannot get there without getting into your car and driving along a side road to the clubhouse. 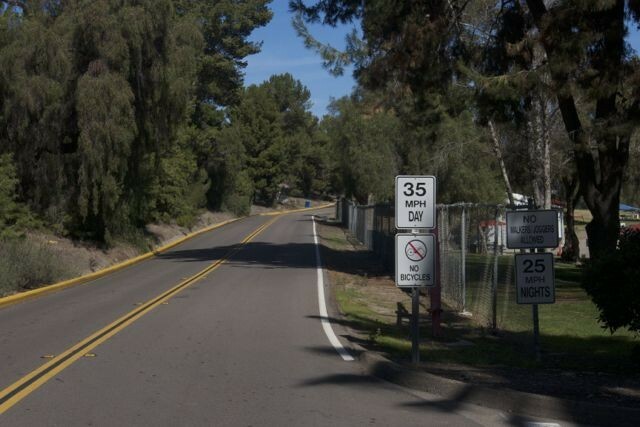 While it is probably less than half a mile to the clubhouse, you cannot walk or bike over there - there are threatening signs saying only cars can go on that road. I mention this because I have no car and purposely stay at RV parks right next to golf courses for just that reason, but I was not able to golf here. There is a practice hole that you can access right from the RV park, but you have to get to the clubhouse to pay for it. The whole thing is pretty silly, but just be forewarned. One last thing - I almost decided not to come based on the review below regarding a "pest problem." I'm glad I ignored it - it looks to be a piece of creative writing by somebody disgruntled about something. I saw zero evidence of mice in the area. Great place to stay while visiting the San Diego area. 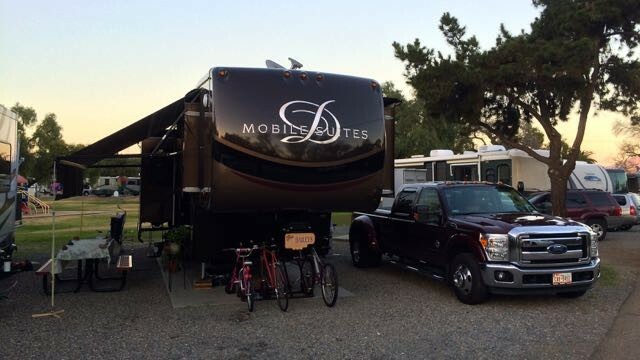 And in comparison to other RV parks and resorts, Admiral Baker is quite the bargain. A word of caution though...if you are in a travel trailer DO NOT stay in spot #46. This spot is a "drive-in" spot meant for a Class A. The hookups were directly outside my front door, including the sewer connection :(. Needless to say, I had to hookup and empty my tanks on my checkout day as my sewer hose was not long enough (I don't carry a 50ft sewer hose). Oh and the dumpster is nearby so if you're a light sleeper light myself, you'll hear the occasional drop of the lid thanks to inconsiderate knuckleheads throwing away their trash at 5am ;(. I didn't have an issue with mice but I did get bitten by a couple of mosquitoes. DEET spray took care of those buggers though. The gals in the office were super nice and the camp host was very helpful when we checked in Friday around 7PM (got caught in traffic on I-15). I mentioned the issue with spot #46 and they offered for us to move but I declined because I didn't want to bother with setting up again in spot #19. Well, enjoy! I love the staff but I hate the pest problems. We have stayed here a few times. My husband is active duty and in a disabled vet. We chose to full time in a brand new huge mansion on wheels. We have to bounce around because the longest military campgrounds will let you stay is a month. This month we ended up at admiral baker and we got a mouse problem a couple weeks into our stay. Last year that we stayed at admiral baker, the ant infestation was really bad but this time they said they sprayed a week before we moved in and we have had no ant problems. The mouse problem however is really bad. Being next to a wooded area because of the river, the mice are coming in and looking for a place for the winter I guess. I spoke to a top rated exterminator in the area and he said the park needs to do something. I would say mice are worse than ants. These things will chew wires and such. If you don't have a good eye to catch these mice in your rig right away, they could have a nest built and cause serious damage. There is a product called "stay away mice" and it's by the same makers of "fresh cab" it's supposed to be a good natural repellent. Since being here at admiral baker, in the past 5 days, I've caught 5 mice in traps and all our food that is in plastic or boxed, is in containers that the mice can't get in. You have to be careful and very diligent when eradicating these pests. I suggest you look into everything on line right down to setting the traps because if your scent is on them, that could make a difference in trapping. We have kids and a baby and the idea of mouse pee and poop on the floor where he is playing and then putting his hands in his mouth is enough to make me flip! You have to bleach everything these mice touch. When I'm done cleaning with bleach, I use peppermint oil but you have to use a lot and apply again every day. I had a mouse come back after a couple days that I thought they were gone because there was no mouse poop. Also make sure you have nothing in your cars and maybe throw some "stay away mice" or peppermint oil in there too. The mouse problem at admiral baker is so bad that one morning, I witnessed a mouse jump off the top of the neighbor's trailer, he kinda slid down the side. These pesky things are capable of amazing tricks. The location of this park is nice but the pest problem has not been solved. I read a comment made by the facility in 2011 that they had pest control but I highly doubt there is any bait or birth control or something put out for these mice. I'm really thinking there is no nest and hoping not but I think they are just coming by in the early morning hours and searching for food. Don't even have a speck of crumb laying around and be sure to take your trash out before you leave the rig or go to sleep. Also if you are trapping, pick a spot they have been where you saw poop and don't clean that spot, lay your trap there because it makes the mice more comfortable with the scent. This is my first time in my life ever having mice and I'm 34. Remember to have dishes clean because they will come for food on dishes too. If they get poop in your dishes or pans or oven, anywhere even the carpet, be sure to use bleach to clean asap. Good luck trying to plug holes in a RV...? Maybe put some traps outside under your rig. There is an electric shock trap that seems great, I'd try that outside. Those nap traps are the best but be sure to watch a video so you set them right. I have experienced many people who think they know how to set the trap but they are not doing it correctly. Remember that these things can nest anywhere and they like it warm, even your engine or generator or air conditioner. And be sure to wipe out your floor vents of mouse poop before turning on the furnace. Good luck! It's a pain and lots of work! Staying at the beach is always the best option and I'd rather deal with roaches than mice, I've decided that since my first mouse problem ever. I wish I could just bomb these things and be done but they keep coming in from outside. And they come and go because I won't see them for a day or so and then boom, mouse poop. Be sure you baby's car seat doesn't have any crumbs too! The only reason I gave this a 1 star is because it was necessary to write the review. This RV campground is terrible. You must park your rig in a parking lot, that is no where close to the office, to go sign in. There are NO SIGNS directing you. It's definitely not handicap friendly. It was explained to me that they were full and that I could pay $12 for a dry camping spot.....BUT......I would have to leave the following day because they were REALLY going to be full the next day !!!!! WHAT ?!?!?! The dry camping area does not have specific spots. It's a gravel strip that parallels the edge of the campground. You simply pick an area of the strip that you prefer. Why in the world would I have to check out of a "first come, first served" overflow spot ?!?!?!?! Quiet time starting at 2200 !!!! Seriously, you're going to charge me $12 to park my rig in the gravel, overflow area AND make me turn my generator off ?!?!?! We will definitely not be coming back here. I would suggest to anyone looking at this place, to avoid it at all costs !!! 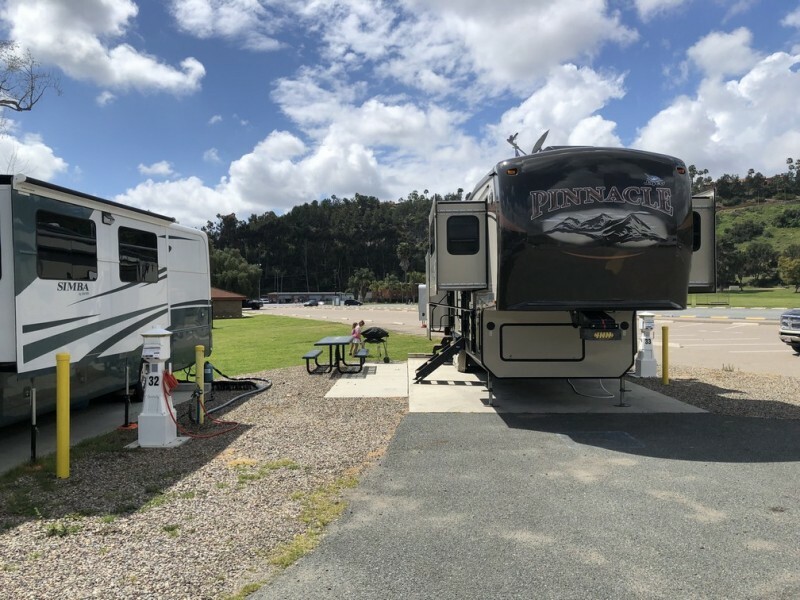 If you are coming in on a weekend, the parking lot is likely full so you may have a difficult time finding a place to stop if you have a towed.There is no dedicated RV stop and check-in as the RV office is a decent walk away from the RV Park. This park is best for its location as you are right next to the stadium and many other attractions. The sites are pretty close together but the pads are fairly level. There is a small concrete pad then gravel around it. It appears that the majority of the people staying here are active duty homesteading and with rent as expensive as it is in the area, can you blame them? That being said, this park doesn't have the same sense of community feel as other parks probably because of the amount of AD folks. Also, I was right next door to a dog that would howl all day until his owner came home from work then his owner would walk him and go out again in the evening leaving him home to howl yet again. People, if you can't spend time with your pets, please don't own pets. Bottom line, if you have something planned in the area this park will work; however, I would still considered other options if available. The location near the center of San Diego County and near Admiral Baker Golf Course was key! 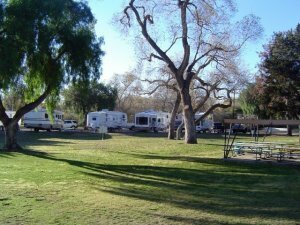 Nice campground in a terrific location for exploring San Diego. Agree with comments in two reviews below; rotten person in 3rd review below is gone. Check-in office is not at same location as RVs. A sign at north end of large parking lot points you to a walking path to the office. Call if arriving after 4pm and they will direct you to the duty camp host for check-in. Rate for military has gone up to $35/day. High, but it is Southern California. We love Admiral Baker. The staff is so friendly and willing to do all they can to make your stay enjoyable. They are very friendly. The grounds are well maintained. Also the Camp Host are very friendly. The location is just perfect for us. All the shopping we need is near by. Access to the golf course makes this an excellent location for the golfers. We have been coming here for five years and think it is the most enjoyable place to stay. Great place to stay for a while. It has FHU and a functioning wifi. The latter is a bit painful and requires a login every 24 hours or a credit card that's not used. It's close to San Diego fun. The spaces are a little bit close together, though not like a commercial counterpart, and the concrete sites are sufficient for your big rig. It's an open base with no gate and the golf course is right there beside you. Qualcomm stadium is within a mile, but I wouldn't walk it as the traffic is heavy and fast. The reservation IT system in Navygetaways is a pain in the back side; call on the phone and the person is very helpful. The Camp Hosts in Space 31 think they own the park, VERY RUDE...very user unfriendly...definitely needs some human interface skills...has zero! The Camp Host in Space 1, however is genuine and has people skills, very nice. If the (so called) host in 31 takes over I will never come back here!!!!! Just a warning! He's a " Gastapo"
I AM NOT HAPPY!! I made reservations online through Navygetaways for April 1-15. When I arrive they tell me I have a space for 3 days, then move to overflow (dry camping), and then go to a space. The fact that I had a confirmation e-mail for the whole time didn't matter to them. 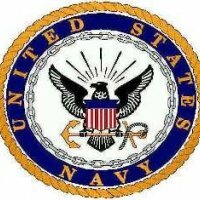 They said their system is different and they have to make reservations after contacted by Navygetaways. To make matters worse, there seems to be some longterm residents here as well. What happened to 30 days max stay that is their policy? This place has great potential because of the location, but instead of a diamond in the rough, it's a very rough spot in a city of diamonds. We have been coming here for 8-9 years. While the location is great there has never been much emphasis placed on clean up of the park. There is no maintenance done to the sites between occupants. They are dirty, leaves have been accumulating for years and it appears the weeds are almost never cut. We watched 2 maintenance people "spray the weeds". They made a half-hearted attempt for a few minutes and then simply walked off never to be seen again. When I inquired why, I was told that was how the navy service was for the park. If you are looking for a long term stay, try Santee Lakes. That's where we will be next year and it's only 10 miles away. 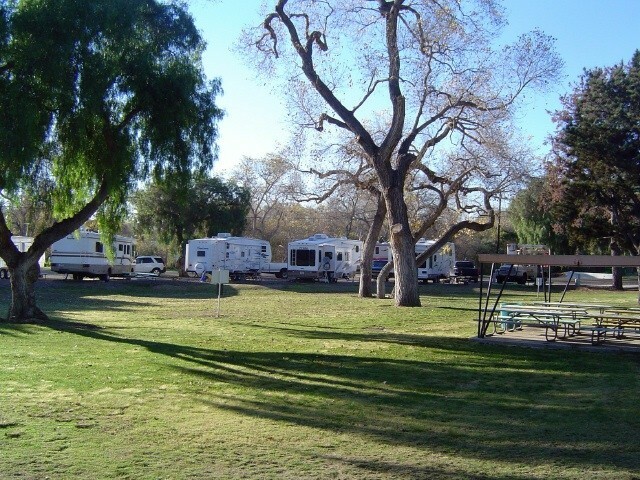 This is a nice RV park in the great climate of San Diego. The sites had level concrete pads (wide enough for your RV) and good hookups with good water quality and pressure. The sites were quite close, however. When our awning was out, it nearly touched our neighbor's RV. Admiral Baker Park (adjoining the RV park) is very nice with several playgrounds for children. WiFi (Go Wifi) wasn't stellar, but it was adequate. Recycling in the park covered only aluminum cans, brown glass, and plastic bottles (no paper, clear bottles, or metal cans), so if you are conscious about recycling, it will be difficult at this RV park. Receiving mail is not easy. The designated general delivery post office (for USPS mail) is a good 15 minute drive and is understaffed and overworked. Picking up your USPS mail is a time consuming and frustrating activity. FedEx and UPS will deliver to the RV park, but even they seem a bit confused about how and where to deliver packages. Overall, we still enjoyed our stay at Admiral Baker and we would definitely stay here again. We spent two enjoyable weeks in February 2014. Checkin was smooth, all our questions were answered and the camp host was helpful. Our site met our needs with full hookups including sewer and cable TV. (An improvement was made while we were there. The old push-down faucets in the mens room were replaced with standard faucets and you can get hot water again.) The location is great - adjacent to Admiral Baker Golf Course and access to the metro system. Green fees are reasonable and the course is pretty well maintained. (There are two 18-hole courses.) San Diego has an extensive trolley system and a stop is nearby in Grantville. A one-way ride for seniors is $1.25 so the two of us could ride downtown to visit the Maritime Museum, the USS Midway and other attractions for $5.00; a real bargain. I was disappointed with WiFi. Signal strength seemed satisfactory when accessible but it would connect for a time and then disconnect. It was very frustrating and I mostly relied on Starbucks (about a 20 minute walk) and cell phone data. It did seem a little better near the laundry room. The Sunday brunch at the golf course clubhouse was good and reasonably priced, opening at 10:00 AM. Another disappointment was a sign at the entrance to the golf course road which says no biking, jogging or walking. It is understandable because the road is narrow with no shoulders but it would have been nice to be able to walk to brunch and back. More on transportation: For longer stays, consider the convenience of a Compass Card for Metro Trolleys and Buses. If you are a walker, the station is about an hour away. There is free public parking adjacent to the stop and there were always available spaces when we came and went. If you do walk, look for a shortcut between Mission Gorge Place (street) and the trolley stop. The best way to find it is from the trolley station. Walk north down the road beside the east edge of the trolley free parking area, turn right at the auction and proceed along a row of small businesses. At the next street go left to Mission Gorge Place. Many long term residents and spaces are some what tight. People staying in overflow when spaces are open and running generators for hours on end. Looks like the grass has not been watered in a long time around the RV park, but across the street in the recreation area it is nice and green and watered daily. Behind our space the grass is dead and now just dirt. Park needs to put a stay limit in place and then follow it. Could be a real nice place, but needs maintenance.